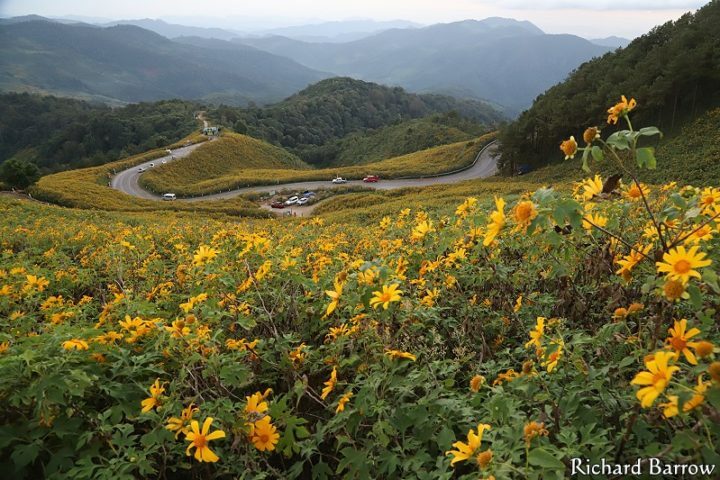 One of Thailand’s most amazing natural sights, the Dok Bua Tong – or wild sunflower – in bloom, can be sen on the hills and in the valleys of Mae Hong Son in Northern Thailand from early November for about one month. The Bua Tong flowers are yellow to orange in colour and have smaller size than the typical sunflower. Originated in Central America and the Caribbean, Dok Bua Tong is said to have been brought into Thailand by Christian missionaries and was previously called Bung Tong or Mexican Sunflower. this article on Richard Barrow.